The harmonic minor scale is a variation of the natural minor scale. Consequently, finding harmonic minor scales on a guitar is similar to finding a natural minor except that it is off by one half step. The harmonic minor scale occurs when the seventh note of the natural minor scale is raised a half step. The note is not raised in the key signature but is instead marked in the music with accidentals (in this case, naturals, sharps, or double sharps). Again, playing harmonic minor scales on the guitar is simple. 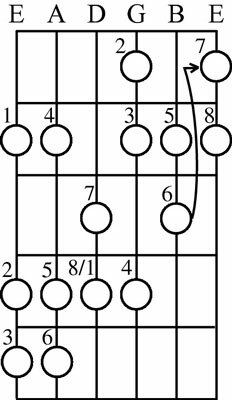 You just position the pattern shown below over the root (tonic) position you want to play in. Move it around to a different root to play the scale for that note. Note how the pattern changes when you add a half step to the seventh scale degree. Click here to download and print this diagram. 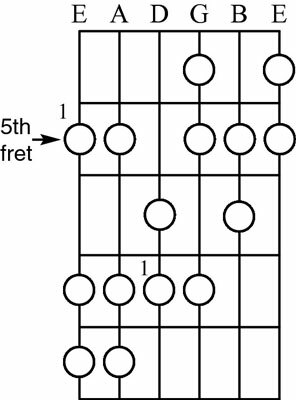 As always, the key is determined by the first note of the scale, so if you were asked to play an A harmonic minor scale on the guitar, you would play what is shown below.